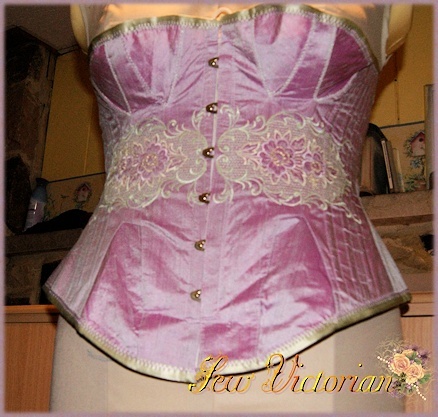 Sew Victorian offers bespoke corsets at a fair price to both you and I. I use high quality materials and offer superb craftsmanship. I strive for outstanding customer service with great communication. I assure great fit though our distance fitting option, which I recommend to everyone. You will find that we offer a few options on all of our custom made corsets, single layer corset with all seams being hong kong bound, double layer corsets as well as fashion fabric corsets with a coutil underlining which could also be single or double layered. Once you decide of the basic type of corset you wish then you can add additional options of extra boning. All of our boning is German steel boning we do not use any sort of plastic boning...EVER. If you would like embroidery on your corset we can do that as well. We also offer embellishments such as crystals and hand sewn pearls and/or a lace overlay. I fully understand custom corsets are a splurge for many people. I try to be as reasonable in my pricing as I possibly can. This is the only reason that I have my distance fitting as an option. It his however an option I strongly recommend. All of my corsets are made to measure. Without the fitting option I cannot assure a perfect fit. All of us carry our weight in different ways. No two women with the same measurements are built exactly the same. I take extreme pride in my craftsmanship and strive for a perfect fit each and every time. Unfortunately, this will not always happen without the distance fitting muslins. I offer corsets that are a great fashion accent all the way to very curvy tight lacing and waist training corsets and everything in between. Just let me know what you wish to accomplish and I will design something to fit your needs. I believe open communication is the key to making my customers happy. I try to answer all my emails and social media messages within 12 hours. Sometimes, life does get in the way. There will be times I am not at home and out of Wi-Fi connectivity for a period of time, but I try to announce on my home page when that is. I have had a few inquires about what constitues a waist training corset and a tight lacing corset are they not the same thing. No, they are different. When I create either, they are made out of proper corset coutil not some sort of cotton drill or twill or worse yet some sort of fashion fabric. A waist training corset if for someone who would like to "train" their waist down to a specific size when corseted. Tight lacing to me is about a 20% or so reduction of waist size. Both types of corset wears wear their corsets continuiously and consistanly. Our fashion corsets are just that fasion great for a night out -- or a night in :) . 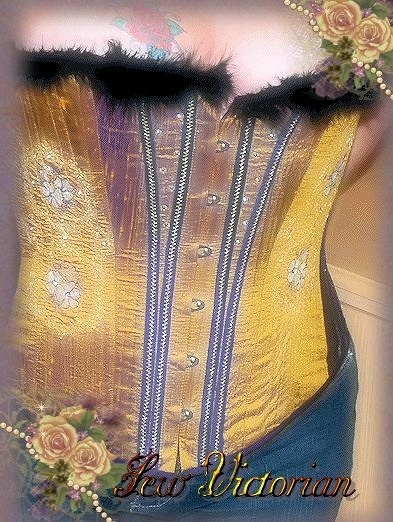 We can make your training corsets and special and as pretty as you want. Just share your ideas and I'll do my best to bring them to life. I do specailize in waist training corsets, if this is not what you are looking for, but would like more of a fashion corset I can do that as well. This particular corset is made of silk with swarovski crystals, decorative exterior bone casings, decorative stitching, silk bindings, and a number of other little details.